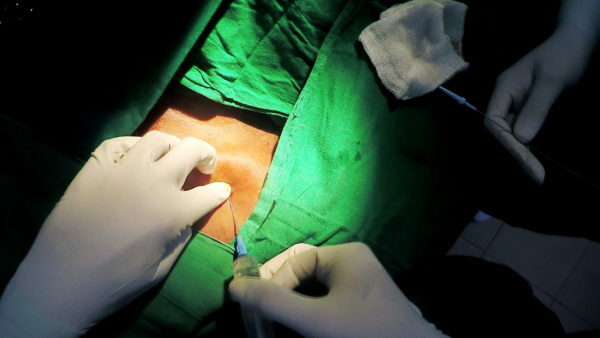 This is a variation of the technique used by anesthetists to access the subclavian vein. The anesthetists approach the vein starting high up in the delto-pectoral groove aiming along the clavicular shaft – this makes the skin puncture site near the clavicle but we need it further below at the top of the future pacemaker pocket. 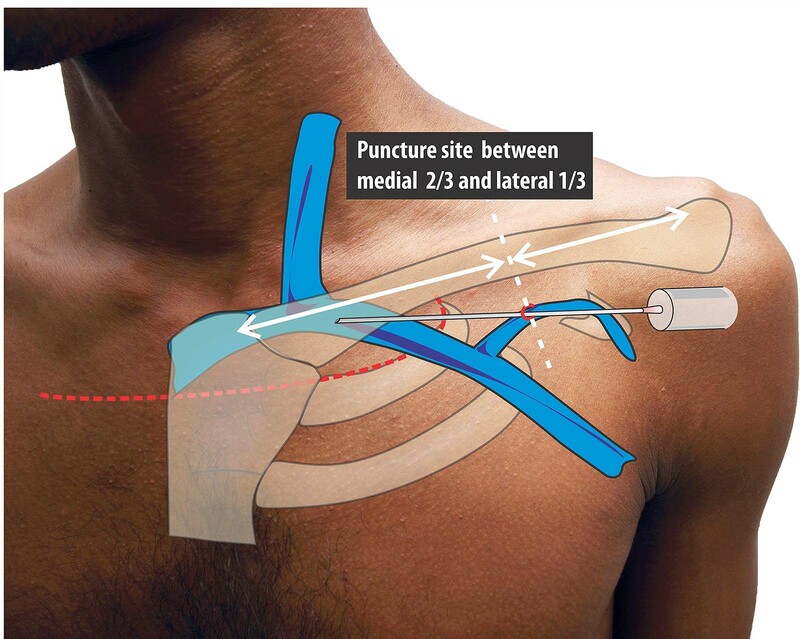 The puncture needle is slowly advanced towards the shaft of the clavicle (at about an 20-30 degree angle to the skin) and once it hits the clavicle, the needle is slightly withdrawn and angulated (increased angle of attack to skin surface ) more so that the tip is under the clavicle. 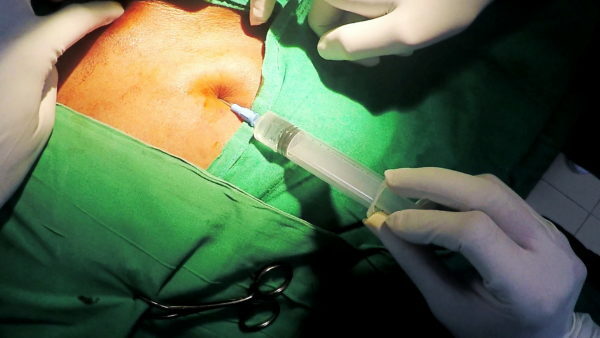 Then, the direction of the needle is changed so that now the tip aims towards the supra-sternal notch. 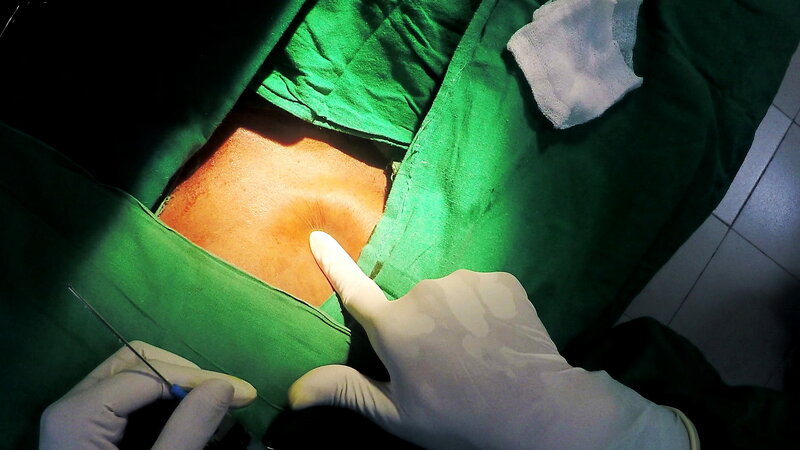 The needle is slowly advanced in that direction (now at a skin angle of 20 – 30 degrees) with gentle suction to see whether it punctures the vein – whence dark venous blood would be aspirated. Once blood is aspirated, the needle is steadied and liberal aspiration of blood is done to ensure good access in to the vein. Thereafter the syringe is removed and guide-wire advanced in to the lumen. Figure : Schematic of final approach to the subclavian vein. This is the final approach to the subclavian vein. (See text above and guide below for more details). Subclavian puncture is relatively straightforward from easiness of venous access. But it has its share of problems and extra-thoracic subclavian / axillary vein puncture is the recommended technique to master. The hollow of the deltopectoral triangle is palpated at 1 – 2 finger-breadths below the junction of the lateral third and middle third of the clavicle. Needle enters the skin here. The needle is advanced at a skin angle of 30 degrees, towards the clavicular shaft. Once the needle tip hits the bone, the needle is slightly withdrawn and the angle of attack is increased as to enter the underside of the clavicle. 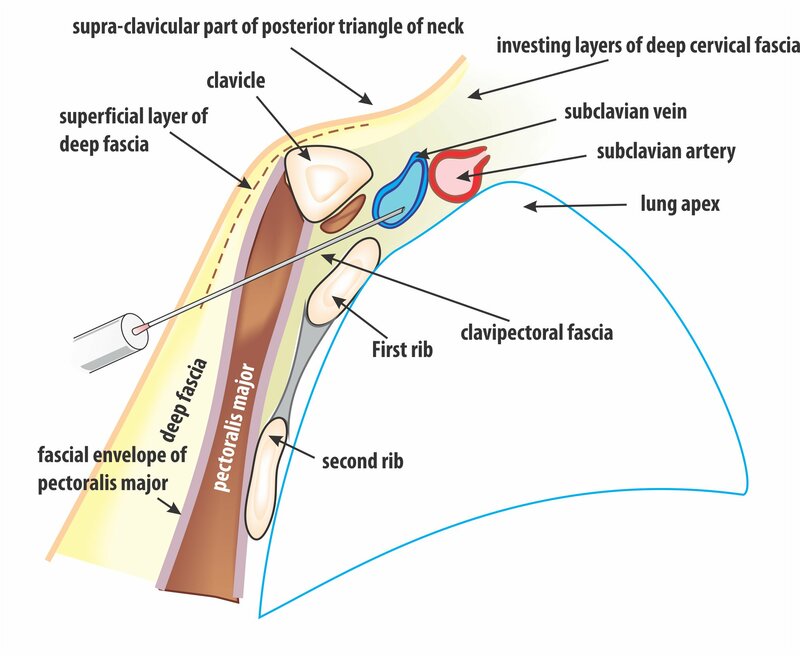 As soon as one feels the underside of the clavicle, advancement should be stopped and direction of the needle change to point towards the supra-sternal notch. 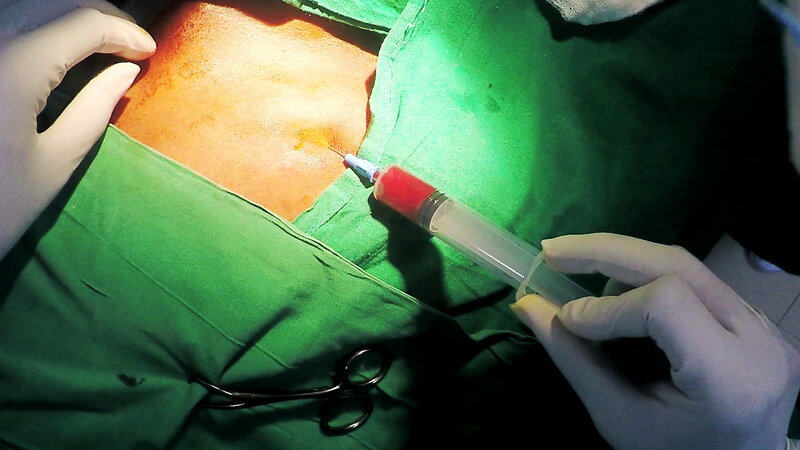 At one point one will enter the vein and blood will be visible in the syringe with suction.A generous amount of blood should be aspirated to confirm venous access. 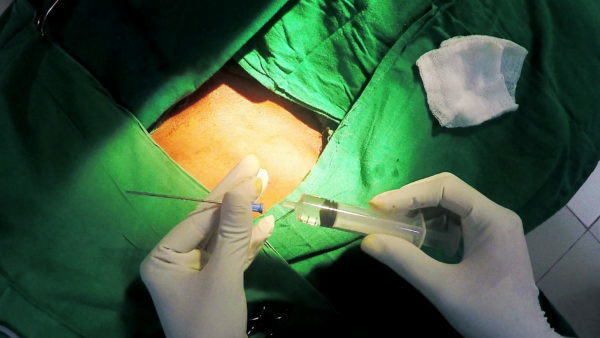 If the vein is not accessed despite full advancement of the needle, one can try sight variation in depth of penetration. 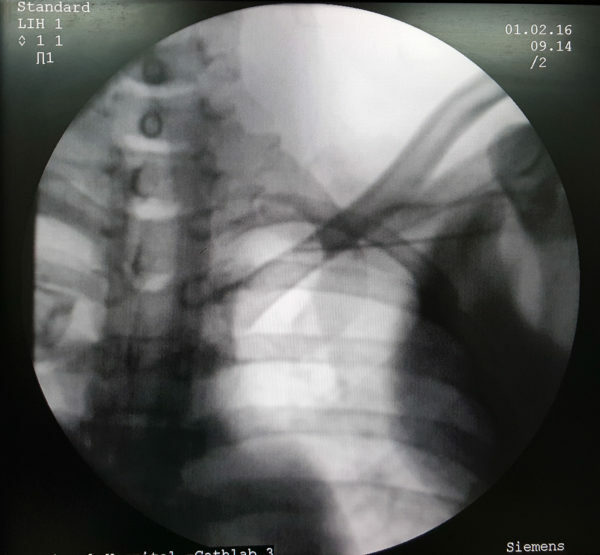 However, the risk of pneumothorax is high in this region and it is recommended that an alternative x-ray guided approach be used.